What a year 2017 was! We are SO excited to share this income report with you guys to show you how we make money online. We have made some massive steps forward this last year, especially in the month of December. The goal is to show you how we make money online and give you some ideas that you can copy and get similar (or better) results! We make the majority of our income from our blogs. The majority of earnings come from affiliate marketing. This means that we make a small commission for every product or service that a visitor purchases after clicking through our affiliate links on our sites. We also make some income from our on-page advertisements but it is a small amount compared to our affiliate marketing earnings. Let’s get started with a full breakdown on how we make money online. This was another record breaking online income month for us. 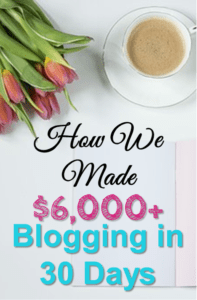 When we first started blogging we would always read blogging income reports from other people, but we din’t really think that we could make over $10k+ a month. It just kind of happened! We were an ‘overnight success’. If you ignore the 4 years of working like a dog 🙂 , many failed attempts and abandoned strategies! Hopefully you can learn something helpful from this income report that will speed up the learning curve for you. This is a very new website (4 months old) so we are very happy with the income growth so far. We have learned so much just by starting this website. Many people look down on ‘make money’ blogs but it has been a great journey for us. Not only do we get to share how we make money online, we also get to research many interesting new ways to make money that we can try and then write about. Paid survey referrals – we make extra money every month by completing paid surveys. It is not a lot of extra money though. However, another great source of income we have is that we receive commission for referring people to our favorite paid surveys. The most popular paid survey site that people seem to love is Survey Junkie. There is a wide variety of paid surveys to choose from that you can try out and promote on your blog to help other people make some extra side income. Here is a list of the affiliate networks (and what we earned from them this month) that we currently work with to promote paid surveys to the readers of this blog. Total = $176.5 from paid survey affiliate commissions. We also used Ebates to get money back on our holiday shopping online. It was only about $20 so we haven’t included it in this income report. Still every little bit helps! The cool thing about promoting paid survey sites is that the customer doesn’t have to buy anything for you to get paid! You get paid for them to make a little extra money! This leads me nicely to the other source of affiliate income from the blog this month…..Online courses. We are addicted to affiliate marketing courses. 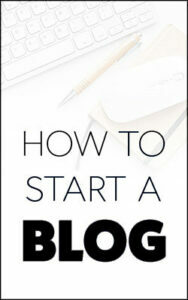 Especially courses that teach you how to drive huge amounts of traffic to your blog or website. The products listed below have been CRUCIAL to our success online and we are excited to promote them to our blog audience (because we TRULY LOVE THEM). Here is a list of the main ones that we have had great success by implementing their teachings. Making Sense of Affiliate Marketing by Michelle Schroeder-Gardner = $78.8 affiliate commission in December (Read the review). Pinteresting Strategies by Carly Campbell = $25.6 affiliate commission in December. The Perfect Pin: How to Create Viral Pinterest Images by Jeff Proctor = $18.8 affiliate commission in December (Read the review). Wealthy Affiliate = $4 affiliate commission in December (Read the review). Amazon = $10.78 earned in December. Traffic to this blog was almost exclusively from Pinterest. We saw a MASSIVE increase in traffic from Pinterest this month as you can see in the screenshot from WordPress below! We had over 17,000 page views from Pinterest in December. Compare that to the traffic in November of just a few thousand views!! Crazy and very exciting! It just shows that all the effort is paying off! We have been using Pinterest for 4 months, with slow but steady growth. We kept reading about how people were getting 100,000+ visitors to their blogs – depressing when we were averaging a pretty pathetic 50 views per day. So how did we multiply our Pinterest traffic 10x in December? We made more appealing pins. Yup it was a simple as that! You can read exactly how we did this here, if you want more information. This massive increase in blog traffic has filled us with hope for the future! Pinterest is a non-linear social media that can take off for you with just the smallest of changes to your pinning strategy! 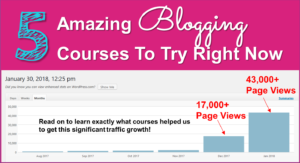 It is very easy to promote a Pinterest course when it gives us results like this! We have seen clicks through to our blog increase at a similar rate to the pin impressions shown above. If you have tried everything and have the basics of Pinterest (group boards, verified business account, etc.) then perhaps what is holding you back is just the quality of your pins? Improving our pins certainly helped us and we can’t recommend How To Create Viral Pins course more highly! We run a couple of other websites that make money via affiliate marketing. The majority of this months affiliate income came from a website that has less than 6000 views per month! We made $10,565.42 from a website that gets 200 views per day! We will be revealing the exact strategy and products that we sell from this stock trading website in the coming months so please check back for future updates (you can subscribe to the blog by signing up in the upper right side bar). Here is a screenshot of the affiliate dashboard (just so you know we aren’t making this up!). This affiliate program makes up the majority of our online income. Hopefully we can grow this blog to a similar income level this year though! We really hope you have learned something useful from this income report. If you have any questions about anything in this article, please leave a question in the comments below and we will answer you as soon as we can! Hopefully, this article has showed you how we make money online and given you some ideas about how you can make some more money! I’m looking forward to reading about your website that gets less than 6,000 pageviews a month and makes that much! Crazy! Thanks for your comment! I know its crazy! This blog had 17000+ views and only made $300 ish in December, but my stock trading site made over $10k with a fraction of the views! The key seems to be the particular affiliate program and products that I use on the stock trading site. I am going to write a full article explaining exactly how it works this year! The funniest bit is that the site itself is quite hideous and seems to go against all the rules of successful blogging! I am trying to replicate the success with other affiliate programs so that I can offer ideas to others in multiple niches. Happy New Year! This is amazing! Congrats on your success! I’m totally going to redesign my pins!! I’m very curious about your other website! Thanks for sharing! Hi Sarah – thanks for your comment! I love your website it looks really nice and some great content!